Despite many Warriors fans from the East Bay showing loyal support to the team, there is a strong possibility the Warriors could leave their current home for much greener pastures across the Bay Bridge. On May 22, 2012, the Warriors held a press conference at the Pier 30/32 site located beneath the Bay Bridge, announcing that the team plans to move to a privately financed and state-of-the-art waterfront arena in San Francisco by 2017. Warriors’ CEO Joe Lacob said they looked at several different locations as well as Oakland, but ultimately decided that the area along the Embarcadero was the best place to have a 21st century architectural masterpiece. Solidifying the decision to move were accessibility to public transportation and the money and tourism expected flow to San Francisco’s nearby business areas. Not overlooked in this equation was the hope that by completely and privately funding the arena, the Warriors might follow the successful business model of the San Francisco Giants’ downtown waterfront stadium. In addition, with a commitment to winning, the move reflects the team’s idea of a “fresh start” and the Warriors believe that they are worthy of a new arena. Oracle Arena is the oldest venue in the National Basketball Association. In June 1996, the site received a $100 million renovation, including the complete demolition and concurrent redesign of the building’s interior, and the addition of 72 luxury suites and three exclusive clubs. The Warriors’ current lease in Oakland expires in 2017. But the Warriors can negotiate an extension for periods of five years, four times (for a total of 20 years) after 2017. Oakland Mayor Jean Quan, who accompanied the Warriors on their NBA Global Games China trip to Beijing and Shanghai last month, has said that she expects to keep the team in Oakland throughout her time as mayor. She faces a re-election battle next year. 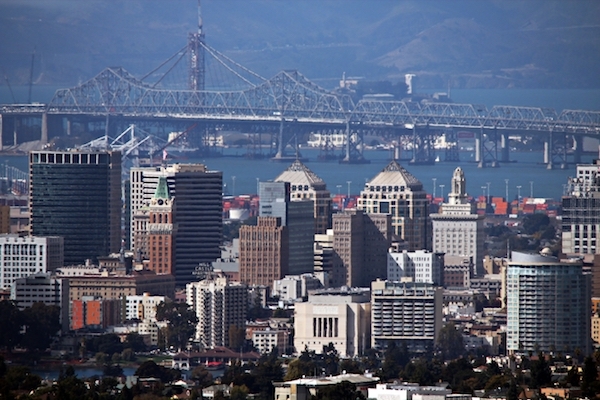 According to Sean Maher, the communications director for Mayor Quan’s office, while there is still a chance that all three Oakland-based professional sports teams will remain in the same vicinity when the Coliseum City project is completed, the Warriors however are not currently negotiating with the city of Oakland. The Coliseum City project aims to transform East Oakland by creating thousands of new jobs, expanding the city’s local tax base, and building revenue the city desperately needs to grow public safety. Not only will Coliseum City be the largest transit-oriented development project in California, but it will also potentially be the second billion-dollar investment made in Oakland this year. On Oct. 15, the Oakland City Council approved an amendment to extend the Exclusive Negotiating Agreement for potential developers that would include a new football stadium for the Oakland Raiders. By landing investing partner Colony Capital LLC, the third largest real estate firm in the world, and investing partner HayaH Holding, Oakland’s next step is to coordinate with the County of Alameda, and then gather at the negotiating table with the full development team, County officials, the Joint Powers Authority, and the Raiders to iron out a deal. In regards to the A’s, this development helps the city to build a new ballpark for them as well. Quan has stated in the past that the city of Oakland is offering the team and Major League Baseball two sites for a potential new ballpark – Coliseum City and Howard Terminal. At both sites, the city has site control and investors prepared to help move a development forward whenever the league and team make their choice. Of the three teams – the Raiders, the A’s and the Warriors – only the Raiders have jumped on board in support with the Coliseum City project. Still, fans remain split right down the middle not only on the Coliseum City idea, but also on the team’s potential move from Oakland to San Francisco. Fans who attended a free Fan Fest celebration in downtown Oakland on Sunday, Oct. 27 expressed mixed feelings on the ownership group’s plans to build a new arena for the Warriors at Piers 30/32 in San Francisco by 2017. Warriors fan Ruben Briones from Alameda said he thinks that it is disrespectful to the die-hard fans in the East Bay if the team moves to San Francisco. Raymond Leung was one of hundreds of Warriors fans in attendance at the Fan Fest rally, but disagreed with Briones on this controversial topic. Whereas there still remain many uncertainties on when and even if the team might actually get a new arena, one thing is clear: the new arena for the Warriors will most likely hold fewer seats than the 19,596 total that Oracle Arena holds. “We don’t have a final number yet, but as of now, we are looking at approximately 18,000 that our proposed San Francisco waterfront arena will hold,” Lisa Goodwin, the director of corporate communications for the Warriors, said. It is well known throughout NBA circles that Warriors fans have consistently supported the team through the good times and the bad. For the past five seasons, the team has averaged over 18,000 fans per game. Last season, the average home attendance for the Warriors was 19,374, the second highest single-game attendance average in franchise history. The team has also averaged over 18,000 fans per game for eight straight seasons, a feat matched by only six other NBA teams during the same period. And this fan phenomenon is not just local. It seems that nationally the team’s popularity is also spreading. In a recent survey, every NBA general manager was asked a series of questions ranging from who is the best player in the league to which team has the best fans. For Mark Jackson, the head coach of the Warriors, he understands why his club was named the most exciting team to watch in the NBA. In September, the Warriors announced that the team established a new franchise record with 14,000 full season tickets sold for this season. With Oracle Arena holding 19,596 fans per game, season ticket holders make up the majority of the attendance for every Warriors home game. The Golden State Warriors have averaged over 18,000 fans per game over the last five NBA seasons. Spectators gather around to see Warriors players participate in a game of horse at “Warriors Fan Fest” celebration in downtown Oakland on Oct. 27, 2013. How come the city of Oakland don’t offer the Howard Terminal site to the Warriors?? ?> I mean Downtown Oakland (which is improving) would be the ultimate spot and neutral location for the S.F and East Bay fans…. sigh Mayor Quan don’t screw this up. I hate this move. They should stay in Oakland, I know slowly that warriors won’t be the known as Golden State. But as San Francisco.And thats not fair clearly jay lacob wants it to be San Francisco team instead of the bay area. That won’t well with other bay area cities.